The Human Development Index (UNDP) consistently ranks Uganda near the bottom, making it one of the poorest nations in the world. An estimated 1.5 million Ugandans are currently living with HIV/AIDS and more than a million children have been orphaned by the disease. Poverty, disease and a tumultuous political history, including a 27 year-long civil war and the terrifying reign of Idi Amin, have left Uganda with a surprisingly young population where 1.2 million children are orphaned. Set into that context, the work that Canadian Feed The Children partner, UCOBAC, does is all the more important and remarkable. Entirely volunteer-based, UCOBAC provides home-based care to the badly-affected rural community of Bugiri, where an estimated 20 per cent of the population is living with HIV/AIDS. Those who are not infected are nevertheless dramatically impacted by this disease. The rate of orphaned children has tripled in the Bugiri region in the past five years. 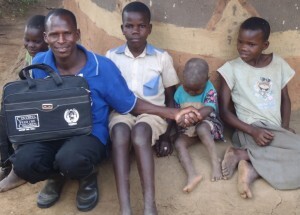 UCOBAC volunteer, Magid, with a family he cares for in Bugiri, Uganda. 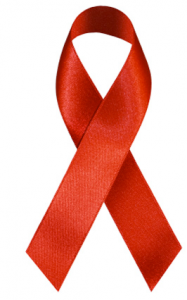 HIV/AIDS infection rates are very high here compared to the national average, in large part due to overall poverty and a lack of awareness and education concerning the disease. This lack of proper education comes with the heavy burden of stigmatization. Widows and orphans are often ostracized, denied inheritances, refused social support and rejected by their families and friends. That’s where UCOBAC comes in. Their intrepid team of more than 300 volunteers – some of whom are HIV positive, and all of whom are residents of the communities they serve and therefore subject to the same poverty and impact of the disease – support families affected by HIV/AIDS to make sure they get the care they need. While many organizations help fight the disease through the disbursement of antiretroviral medication, UCOBAC takes its program one step further and addresses not only the physical, but the emotional and social stigma attached to this disease. 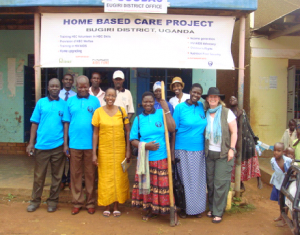 Executive Director, Debra Kerby (front, right) and Program Manager, Mueni Udeozor (back, right) with UCOBAC volunteers, Bugiri, Uganda, June 2011. They also support income generation and livelihood development, by giving goats and chickens, gardening equipment, seeds and trainnig and other forms of livelihood support. “With this income, families are able to have more than one meal a day and children are able to go to school. Families who receive support have safe, hygienic homesteads with separate housing for their livestock, a separate kitchen and a latrine,” says Christina Sempebwa, CFTC’s Country Representative in Uganda. Repairing homes, building latrines, planting gardens, giving mosquito nets to help stop the spread of malaria and administering rehydration salts and antiretroviral medication to families — all of these are on the typical UCOBAC volunteer’s regular to-do list. But beyond practical assistance, home-based care volunteers also provide families with counseling and friendship, an essential element to help these families rebuild a sense of trust, self-worth and pride. 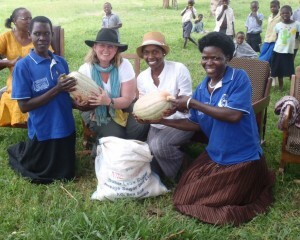 UCOBAC volunteers with Debra and Mueni showing off some of their produce. While AIDS has claimed at least one million lives a year in sub-Saharan Africa since 1998, AIDS-related deaths have steadily decreased due, it is believed, to better distribution of free antiretroviral therapy. That’s good news for the people of Bugiri, Uganda – but the better news is that UCOBAC’s home-based care volunteers are still fully engaged members of their communities providing holistic, compassionate care – one neighbour to another.